Silver prices in December have been all over the place. December started with a weakening dollar and some short covering. This was enough to propel silver prices this month as much as 3.4%. Silver had its third most productive week on the year last week – up 4.6%. But that rally was short-lived. 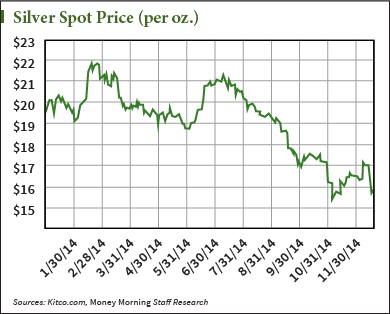 On Dec. 9, silver topped out at $17.105 an ounce. Since then, silver has fallen as much as 8.1% to $15.715 on Dec. 16. This was just $0.40 from the four-year low it hit in early November. Silver prices have been enough of a headache this year as is. At one point, the white metal was trading around $22, only to fall in November to levels it hasn't seen since 2010. December began to see a rally – that is, until last week. Silver bottomed out Tuesday at $15.715. But silver is up again above $16 this afternoon (Friday). The sharp drop followed by the quick upsurge is mostly at the hands of pretty easily identifiable factors. Here's why the price of silver in December has been bouncing around so much. Believe it or not, there's a lot to suggest that silver was on the upswing. Silver posted consistent gains after the prolonged, five-month slide that pushed prices down almost 30%. Bearish sentiment was winding down. Just look at the futures market. On Oct. 28, speculators were short silver in high volumes. They held 51,711 contracts representing 258.6 million ounces short. That's almost a quarter of the total demand for silver in 2013. All of which was held in paper contracts betting on its downside. It marked the highest volume of silver short positions on record. And that bearish sentiment left the door open to a massive short squeeze opportunity. The bears retreated slightly, but not in large enough numbers to help silver soar. And it didn't help that money printing in Japan – and talks of money printing in Europe – were strengthening the dollar and providing another headwind to silver. That's why in November, prices didn't make any dramatic moves up. They did move up 2.3% – the first month of positive gains since June. But that's nowhere near the lift that past instances of short covering have provided. Massive short covering in June shot prices up over 14%. December marked the month that silver was poised to pop. From the October record, short sellers were shedding an average of 23.4 million ounces of silver a week to their positions. A short squeeze was underway. This all culminated in the 4.6% advance last week. As of the most recent Commodity Futures Trading Commission report, speculators held 118 million ounces silver short. That's 140.5 million ounces less than the October peak. Prices hit a six-week high of $17.105 Dec. 9. Momentum was up, and silver seemed to be having a quick end-of-the-year rally. Regardless of Silver's 2014 Volatility and rapid/steep fall from grace since Sept, the following often unacknowledged (FACT) reality exits: There is an apparent, significant shortage of physical silver globally at these prices. No major domestic precious metals or coin dealer has ANY silver coins in stock since late Summer. This includes " junk silver", as well. Even if you could find any silver coin in stock, there would be a 19% premium added onto the current spot market price of silver. 2015 issue Silver Eagles won't be available until late January and only on an allocated basis to primary dealers. At these prices, supplies may not last the Winter. Are the prices of precious metals being manipulated in any way? Sure seems that way. I would expect the paper price to eventually move up closer to the actual market price of a metal where supply is far less than current retail demand.